Temporary Tattoo Airbrush Kit - 6 Color Set - With Compressor and Stencils. 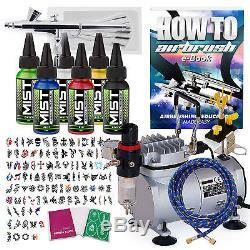 Complete airbrush temporary tattoo kit, perfect for all levels from beginner to professional. Contains everything you need to start airbrushing the day it arrives. With 100 professional-grade stencils to choose from, you'll never run out of design combinations. Stencils come printed on ultra-durable, reusable sticker sheets with self-adhesive backing; easy to clean and even easier to use. Set comes with six bottles of long-lasting temporary tattoo color. Alcohol-based colors mix easily to create new shades and are airbrush ready (no dilution required). 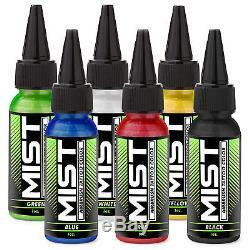 Includes a premium, dual-action, internal-mix airbrush perfect for detailed work. The airbrush's solvent-resistant needle packing is safe to use with all airbrush mediums, not just tattoo colors. A clamp-style airbrush holder for up to four airbrushes helps keep your workspace organized. 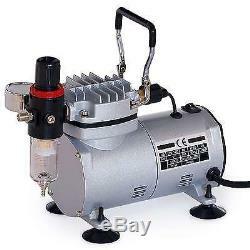 Included professional-grade airbrush compressor quietly delivers consistent air pressure for even results. The oil-free compressor design makes this set-up perfect for nail art, food decorating, body art and all other standard airbrushing applications. Airbrush connects to the compressor with an included 10 foot braided air hose. Five wire brushes are included for quick and easy cleaning when you're done with your work. Includes instructions and five exclusive educational airbrushing guides to improve your skills. Premium dual-action, internal mix airbrush. Precision-crafted body provides a balanced feel in the hand. Tight-tolerance head provides extremely fine atomization with razor-sharp detail. Needle backstop at the rear of the airbrush allows you to pre-set the trigger travel, producing consistent line widths. Includes pre-installed 0.2mm nozzle (tip), nozzle cap, needle, and removable needle cap for a spray pattern between hairline and 3/4 (20mm). Fine-finish, stainless-steel needle minimizes tip-dry. Gravity-feed 2cc color cup won't obstruct your view during fine detail work. Solvent-resistant needle packing allows safe use with all types of spraying mediums. Uses standard 1/8 BSP air hose fittings. Delivers excellent power (1/5 horsepower, 1.0 CFM) with ultra-quiet operation (55 db). Works on demand, running until it reaches approximately 58 psi, then cycling off until pressure reaches 40 psi before restarting. Auto-start/stop feature saves power and reduces motor wear & heat while maintaining enough pressure to operate most airbrushes. Compact and lightweight (8 pounds) with easy-carry handle. Rubber feet to protect your work surface. Oil-less design makes this compressor suitable for food decorating, body/nail art and all other standard airbrushing applications. Maintenance-free, CE certified and thermally-protected. Uses standard 1/8 BSP male outlet. Uses 6 foot US-standard 120 volt power cord. Dimensions: 10" long, 4" wide, 7 tall. Ultra-durable, high-pigment temporary tattoo ink. Can be used for temporary tattoos, special-effects or body art airbrush paint. Superior sprayability and unrivaled coverage. Paint colors can be easily mixed to create new shades. High-grade pigments lasts up to 10 days. Easily removable with baby oil or isopropyl alcohol. Ready-to-use straight out of the bottle, no dilution required. Alcohol-based paint dries quickly and is water resistant. Paint is non-toxic and safe for skin, but should not be used near eyes or face. Colors are included as full-size 1 ounce (30mL) bottles. The following colors are included. Red, Blue, Yellow, Black, White and Green. Professional-grade, easy-to-use temporary tattoo stencils. Organized into an 8.25" by 11.25" book. Designs are reverse cut so only the image remains after airbrushing. Easy to produce quick and consistent results. Self-adhesive backings hold stencils securely in place. Durable, reusable stencils are easily cleaned with alcohol. Holds up to four airbrushes, with two tilting, coated, and fully adjustable airbrush cradles at the base of the stand and two coated swiveling base holders. Mounts quickly and securely to any surface up to 2 thick. High-density foam secures the clamp while protecting surfaces from damage. Removable bracket for standard airbrush regulator mounting. Includes a download link for the following five educational guides. 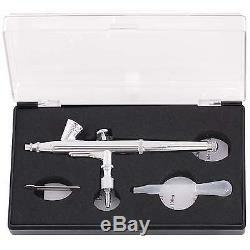 1 premium dual-action gravity feed airbrush with pre-installed 0.2mm nozzle set. 6 ultra-durable temporary tattoo colors. 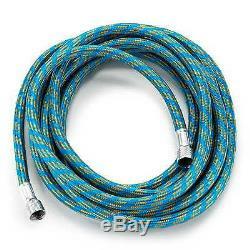 1 ten foot braided air hose with 1/8 BSP standard fittings. 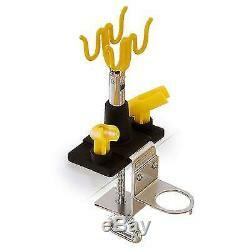 1 clamp-type, edge-mount airbrush holder (for up to four airbrushes). 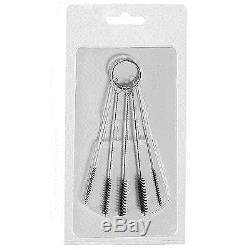 5 airbrush cleaning brushes on a key ring. 1 barbed hose airbrush connector. 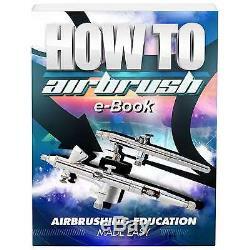 5 exclusive educational airbrush guide downloads. The item "Temporary Tattoo Airbrush Kit 6 Color Set With Compressor and Stencils" is in sale since Wednesday, November 30, 2016. 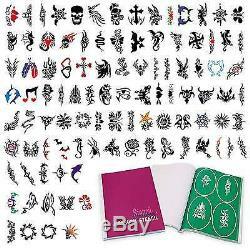 This item is in the category "Health & Beauty\Tattoos & Body Art\Temporary Tattoos". The seller is "professionalemporium" and is located in Fort Lauderdale, FL. This item can be shipped to United States, Canada, United Kingdom, Denmark, Romania, Slovakia, Bulgaria, Czech republic, Finland, Hungary, Latvia, Lithuania, Malta, Estonia, Greece, Portugal, Cyprus, Slovenia, Japan, China, Sweden, South Korea, Belgium, France, Ireland, Netherlands, Poland, Spain, Italy, Germany, Austria, Russian federation, Mexico, Switzerland, Norway, Ukraine, Croatia, Brazil, Chile, Colombia, Costa rica, Dominican republic, Panama, Trinidad and tobago, Guatemala, El salvador, Honduras, Jamaica.